To get a firm understanding of government’s entitlement mentality, imagine this conversation taking place at your neighbor’s front door. Such harassment would cause a public uproar so instead of sending out collection agents, local school boards use your money to hire the Kansas Association of School Boards, which makes the same case to legislators. KASB published a three-part series last week, making the case that school funding and other government spending hasn’t kept up with the growth in personal income. KASB lays the guilt trip on legislators, who know they will get prodding calls from superintendents and others pushing their entitlement story. Legislators also know that failure to comply will unleash negative comments about them in the community, the unions will target them, school staff will use school computers to send chastising emails and students will be told that the mean old legislator will cause one of their programs to be cut. The constitution doesn’t say funding is a percentage personal income, but KASB makes it sound as though citizens are cheating schools because (a) guilt works and (b) they really do feel entitled, and not just to a share of what’s deceptively called personal income. They’re entitled to spend more than necessary, entitled to not spend all of the aid provided and they’re entitled to do so without any consequence for persistently low achievement. Part 1 of the KASB series also attempts to make the case that personal income is growing slower than the national average, which they believe proves that tax reform didn’t work and is therefore justification for a large tax increase (so they get their cut). Think about that; they say personal income is sluggish and their solution is to make matters worse with higher taxes! 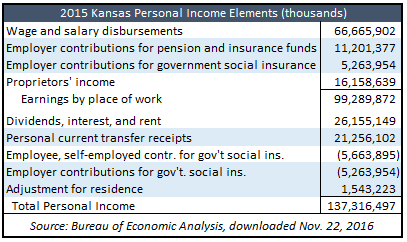 KASB says growth in personal income measures ”…how much people can spend, save and invest.” But that’s patently false. The government definition of personal income includes several amounts that aren’t available, including employer contributions for retirement and medical insurance. Some personal current transfer receipts[i] go to people, but collecting disability payments and unemployment certainly doesn’t allow people to save or invest, let alone pay more taxes. 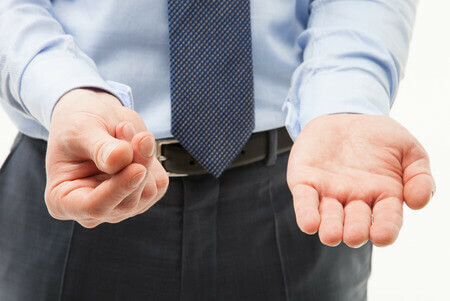 KASB even feels entitled to a share of Medicaid and Medicare payments! Increases in the gross income of proprietors and rental payments may also not translate into an ability to pay more. KASB shared their data, which showed that they used outdated personal income amounts (BEA routinely restates prior years’ data) and they calculated average annual increases as a simple average of each annual change rather than the compound annual growth rate (CAGR), but the variances were minimal overall. Their claim that personal income is trailing more since (and by implication, because of ) tax reform, however, is very misleading. Kansas historically trails the national average as KASB showed, but the change since 2013 has nothing to do with tax reform. 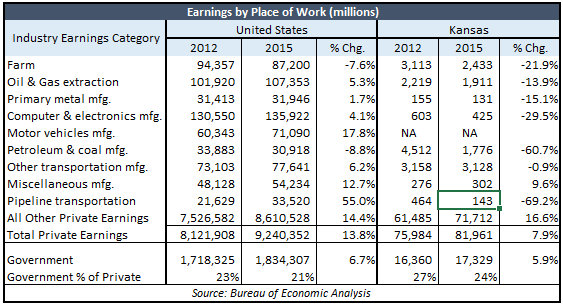 The following table of Earnings by Place of Work (see above table for the personal income components included) shows that a small number of industry-specific issues are distorting the overall change in private earnings. In fact, aside from those few industries, private earnings in Kansas is running ahead of the national average. Farm earnings are down in Kansas and across the country, but Kansas is hurt much more. Oil and gas extraction, petroleum manufacturing and pipleline transportation have been devastated in Kansas and Other Transportation (mostly aerospace in Kansas) has also been soft. Categories such as primary metals, computers and electronics fluctuate with the demand for the specific products produced in each state. There’s also been large growth in auto manufacturing across the country but Kansas’ small amount cannot be shown for privacy reasons (too few producers) so it’s included in Miscellaneous manufacturing. On everything else, private earnings grew by 16.6 percent since tax reform whereas the national average was 14.4 percent. That’s not to say that tax reform gets the credit, but the data clearly refutes any notion that tax reform is to blame for trailing the overall national average. Note also that government earnings are growing slower in Kansas than across the country (which is part of the reason Kansas trails the national average) and that’s a very good thing for several reasons. Government is a larger share of private earnings in Kansas, which creates a greater drag on private earnings than the rest of the country. And government earnings are a larger portion because Kansas has much more government than the national average. For example, Kansas has 25 percent more state employees per 10,000 residents than the national average and 35 percent more local government employees; Kansas is actually the second-worst in the nation for local government employees. As Abraham Lincoln said, ours is a government of the people, by the people and for the people but some in government seem to think the people are here to serve government. We do need to pay taxes but only to the degree that allows government to efficiently provide good services with improved outcomes. We’ll have more discussion on the KASB entitlement pitch tomorrow, examining their claims and state tax revenue, state spending and school funding. [i] Defined by BEA as payment to persons for which no current services are performed, as well as payments to non-profit institutions by governments and by businesses. Government payments to individuals includes retirement and disability insurance benefits, medical payments (mainly Medicare and Medicaid), income maintenance benefits, unemployment insurance benefits, veterans benefits, and Federal grants and loans to students. Government payments to nonprofit institutions excludes payments by the Federal Government for work under research and development contracts. Business payments to persons consists primarily of liability payments for personal injury and of corporate gifts to nonprofit institutions.